California is an absolute mecca for photography and every time I go, I manage to find a new spot that offers nothing less than stunning images. In reality you could spend years slowly making your way up the CA coast and you would always find some new breathtaking image. However, this is a blog that outlines some of my favorite spots so far. I will admit this list is lacking, but I will add to it as I photograph more locations. If you have a spot you recommend let me know, I am always down to visit something new! Big Sur is one of the most beautiful spots not only in California, but I'd argue in the US. I've been traveling to Big Sur and Monterey to visit family ever since I was a young boy. Some of my fondest childhood memories include Thanksgiving dinners by the beach and camping in the rolling hills of Big Sur. Only recently have I started appreciating this place as a photographer's gold mine. Photo of the Bixby Bridge, just south of Monterey. I took this shot twice, once before sunset and once after it got dark. I then combined the two images. If you are traveling to Big Sur there are a couple of spots I'd recommend going for photography. If you're in Monterey, head south on highway 1. 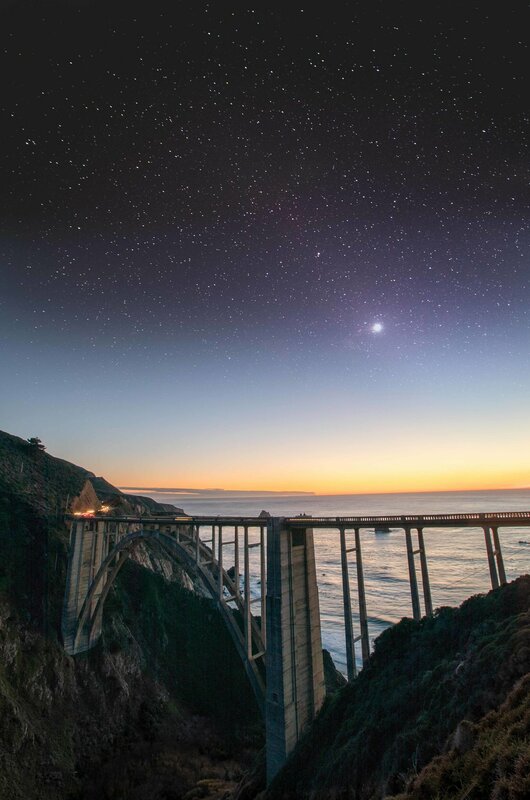 Your first stop for a stunning photograph is the Bixby Bridge. This 714' long bridge spans a giant ravine, shooting 280' to the beach. Don't be alarmed by the swaths of Japanese tourists driving mustang convertibles, they also read my blog and couldn't resist traveling there. The best time to go is around sunset. If you stand to the east of the bridge up the small dirt road you can get a photo of the sun setting behind the bridge. When I photographed the bridge I took a sunset and post sunset photo, then merged them to get what you see above. In reality there are tons of great beach areas, especially in and around Los Angeles. Huntington Beach, Hermosa Beach, Venice Beach and so on will all offer unique spots to get very cool shots. One of my favorite is Manhattan Beach. I think the pier has enough "stuff" on it to help add some flair to your photo. There is also never any shortage of surfers there to act as a subject for your photos. The two photos below were captured at the same day in February. This time of year the sun sets perfectly in line with the pier so you get some amazing backlit photos. Just like Hermosa Beach, Santa Monica offers some absolutely stunning photography opportunities. The pier has an amusement park that hangs over the beach. This combined with some stunning sunsets makes for some great composition. This is another one to visit at sunset. I'd also recommend staying to get some great night shots. The ferris wheel lights up at night and it makes for some great long exposures. Just north of Big Sur is Pacific Grove, a small town that is a part of the Monterey area (also money for photography). From Lover's Point to Asilomar Beach there are tons of tidal pools that are backdropped with massive waves, seagulls, seals and if you're lucky, whales. Every time I have gone out here I have been able to capture some awesome sunsets. I recently went out for sunrise and shot NE from Lover's Point, the colors were amazing. Santa Barbara is just up the cost from Los Angeles. If you're looking for a fun trip, take the two hour train from downtown LA to Santa Barbara. You get some great views of the coast and you don't have to sit in miserable traffic. Santa Barbara has a ton of great places to stay, eat and photograph. When we visited there we ended up going on a sunset cruise and I managed to get some pretty epic shots. I also, took some of my favorite photos from my hotel room window. If I had more time I would have also traveled into the mountains a bit because there is apparently some pretty epic hikes in the area. 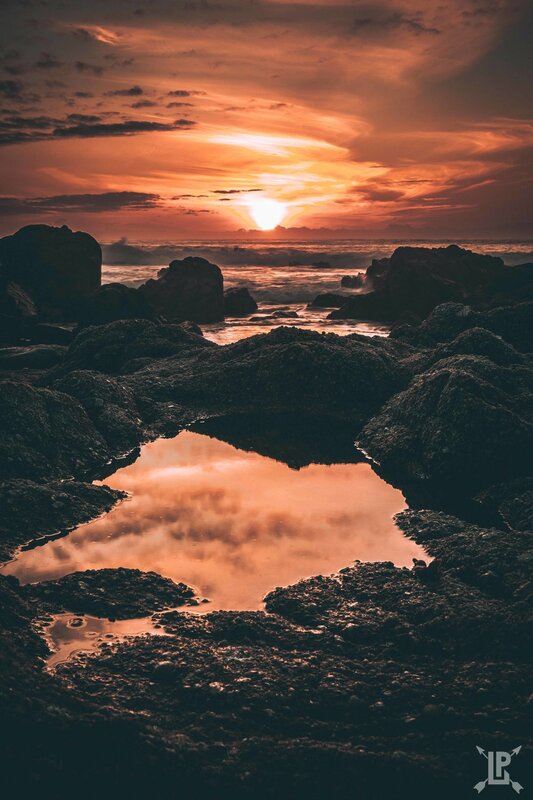 El Matador Beach is located near Malibu and is an absolute mecca for photography. When I went there I saw no less than five separate photoshoots going on to include a wedding and one for Puma. There was also a couple wacked out on acid having their own photoshoot that got pretty weird.... but I digress. I highly recommend coming here on a weekday since the weekends get pretty crowded. Also, I'd make sure to go here at sunset for the best shots. Should You Buy A Social Media Account?